Find it difficult to find the right proportions when drawing? Sight Size is an app (iOS/Android) for comparing images. Using the app one can transparently view two images at the same time, and adjust the images so that they can be seen in the same scale. This is similar to viewing the images on a traditional light table. The app is intended as a learning tool when drawing or painting. Then the first image would be a reference image of the object being drawn (for example, a face, landscape, or some fruits as in the above screenshot). The second image would be the drawing (drawn with pen and paper). By seeing both images transparently over each other and at the same scale, one can see where the drawing is off, and which parts need to be corrected. This is not always easy to see otherwise. The name Sight Size comes from a classical method of drawing where the subject and the drawing are placed so that from a fixed vantage point, they the can be compared at the same scale. Slider: Adjust transparency of images. Lock/Unlock: Locks images so they can be panned and zoomed either independently or locked together. Black and white mode: This can be particularly useful for finding the areas of darkest shadows vs. lightest light. Mirror mode: Get a fresh look by viewing everything in a mirror view. 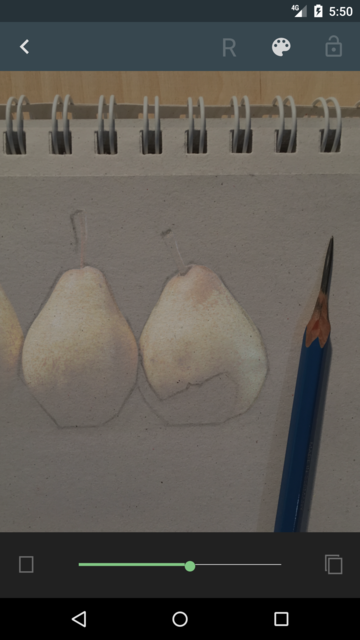 The reference photo of pears by Clem Onojeghuo. Example drawing MD.